What is channeling? It is a good question. Channeling is what we call it when one serves as a channel through which another being interacts with Life. Usually it is in the form of verbal communication. The “channeler” serves as a vessel into which another being of Life brings a portion of its Essence. It could be seen as a partial possession allowed by the channeler in order to allow the other being of Life the partial use of a portion of his/her body. For example, when I channel, I go into a meditative state and then allow Archangel Michael (or whomever I am channeling) to bring his Essence down into my body and use my vocal cords to speak with. That is channeling. Sometimes channeling involves further use of the body, such as the head (for smiles, nodding, etc.) or the arms and hands (for gesturing, etc.). The Archangels do this often, as do Mother Earth and the Great Mother. Other Guides do this as well. The person doing the channeling can usually hear what is being said, but has no control over what is being said. The words do not originate in the brain of the channeler, so that person will most often have very little memory of what was spoken unless they discuss it right afterward or hear it from a recording. Channeling is not something that a person should seek to do unless he/she has a very strong and secure relationship with his/her spiritual Guidance. Channeling is a very magical, mystical, and beautiful experience for the channeler and all those who are part of the channeling session. However, there are many negative entities “out there” who are quick to take advantage of the willing Heart of a person innocent to their ways. These entities serve their own purposes which can range from simple entertainment for themselves to outright harmful information and/or activities. The basic rule on channeling is that one must first be very secure in their relationship with whomever he/she is open to channeling. It is important to note that most spiritual guides come to us, and not the other way around. It is of the utmost importance to note that when a “potential” spirit guide presents itself, he/she/it should carry an energy of sublime Love. If one feels uneasy or threatened, then the offer of spiritual guidance should be declined. We all have angels around us all the time. If we ask them for their Support, they will give it to us. When we meditate with our Angelic Families, we will come to know their energies. When we learn what these beings feel like, then we will always know who is present. If one is open to channeling for these beings, it is imperative that the true identity of the being is known. If not, it is easy to open oneself to deception and possibly harm. With this Understanding, one can appreciate all those who do serve as channels for other beings of Life, giving voice to infinite wisdom and ultimate Love. I have done a great deal of channeling. I have also had a great deal of channeling done on my behalf. It is a blessed experience either way. © Copyright 2012-2018 The New Gaea Foundation™ and Mia Mona Muriel Amore. All Rights Reserved. 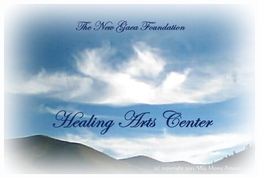 The New Gaea Foundation™ and Mia Mona Muriel Amore.